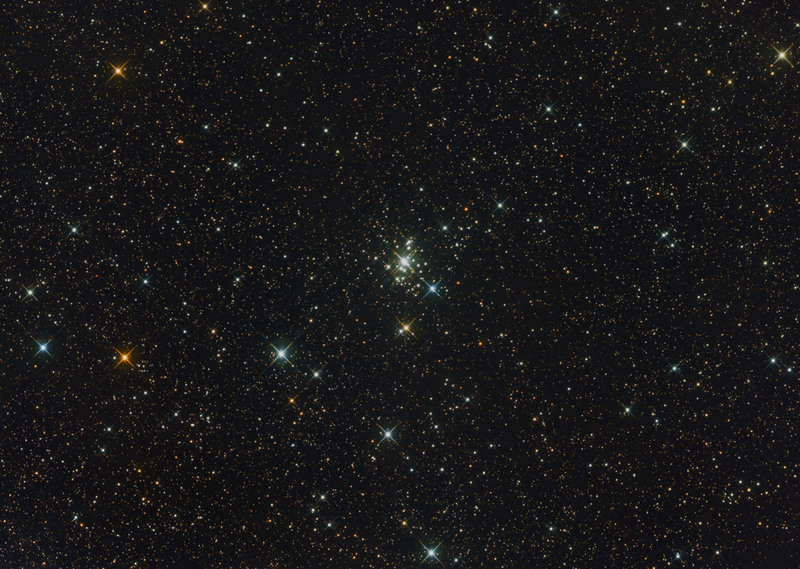 NGC 1502 is an open cluster in the constellation of Camelopardalis. It was identified for the first time by William Herschel on November 3, 1787 through a 18.7 inches reflecting telescope. He described it as a star cluster rather rich and remarkably dense, with a little 'elongated shape. His son John Herschel observed it later and then included in his General Catalogue of Nebulae and Clusters with the number 802. NGC 1502 is very young, its age is just 11 million years. It consists of at least 19 components brighter then magnitude 11, the brightest of which is Camaleopardis SZ, an eclipsing variable located at the cluster's center. It is believed that even the blue supergiant α Camelopardalis originally was a member of the cluster, but then it would have been expelled from it, becoming a runaway star. The cluster is located at 821 parsecs (3400 light-years) away and lies on the outer edge of the Orion Arm. The six most brilliant cluster components are of spectral type B3 or warmer; among these, the two brightest stars are spectroscopic binaries and form along with their weaker companions the star system ADS 2984. NGC 1502 belongs to the association OB1 Camelopardalis, in particular to the subgroup Cam OB1-C. The total size of the association, taking into account an average distance of 1000 parsecs, are approximately 70-90 parsec, a fairly typical diameter for OB association. To Cam OB1 are tied several nebulae, including the H II region Sh2-205 and reflection nebulae VdB 14 and VdB 15.